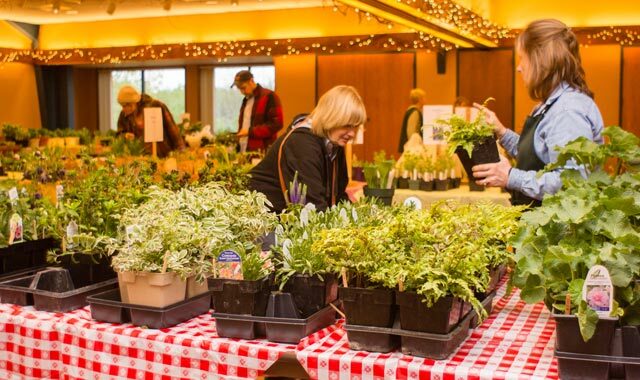 Stock up on native plants during the spring sale at Klehm Arboretum & Botanic Garden, in Rockford, on May 11. Through May 13, Mon.-Sun. 10 a.m.-5 p.m. Operate wheels to help Curious George climb a fire escape, sort and weigh fruits and vegetables at the produce stand, build a whirligig at the farm and enjoy other fun hands-on activities that explore science, math and engineering. Discovery Center Museum, 711 N. Main St., Rockford, (815) 963-6769, discoverycentermuseum.org. Through June 30, Tue.-Fri. 9 a.m.-5 p.m., Sat.-Sun., 10 a.m.-3 p.m. Enjoy being surrounded by live butterflies; see the butterfly life cycle in action as you view butterflies emerging from their chrysalis. Nicholas Conservatory & Gardens, 1354 N. 2nd St., Rockford, (815) 987-8858, rockfordparkdistrict.org/ncg. April 7-8, Sat. 10 a.m.-5 p.m., Sun. to 4 p.m. See more than 225 re-enactors portraying soldiers and civilians from World War I. Enter encampments, tour a reproduction 150-yard trench system and watch large-scale battle re-enactments. Midway Village Museum, 6799 Guilford Road, Rockford, (815) 397-9112, midwayvillage.com. April 7-8, Sat. 10 a.m.-6 p.m., Sun. to 5 p.m. See new trends in landscaping, decks, backyard ponds and waterfalls; discover gadgets for the garden enthusiast. Clinics; plant and shrub sale. Forest Hills Lodge, 1601 W. Lane Road, Loves Park, Ill., (815), 871-7469, showtimeproduction.net. April 21, 9-10:30 a.m. Bring your binoculars and dress for the weather as you look for returning spring birds. Reg. online. Byron Forest Preserve District, 7993 N. River Road, Byron, Ill., (815) 234-8535, byronforestpreserve.com. April 21, 10 a.m.-2 p.m. Family-friendly event with hands-on activities for children, a mini zoo, food trucks, vendors focused on the environment and free admission to the gardens. Rotary Botanical Gardens, 1455 Palmer Dr., Janesville, (608) 752-3885, rotarybotanicalgardens.org. April 21, 10:30 a.m. On this guided walk through the Vi Bates Garden, learn about woodland plants native to northern Illinois and what plants will do well in your shady yard. Klehm Arboretum & Botanic Garden, 2715 S. Main St., Rockford, (815) 965-8146, klehm.org. April 21, noon & 1 p.m. Bring the family to learn about bee jobs, communication, products and safety. Taste local honey and make a bee project. Nicholas Conservatory & Gardens, Rockford, (815) 987-8858, rockfordparkdistrict.org/ncg. April 22, 9 a.m.-noon. Scouts become master gardeners and horticulturalists as they learn about the parts of a plant, the process of photosynthesis and more. Register online. Klehm Arboretum, Rockford, (815) 965-8146, klehm.org. April 23 & May 12, 9 a.m.-noon. Join fellow volunteers to remove invasive species from the woods. Dress for the weather and be prepared to get dirty. Severson Dells Nature Center, 8502 Montague Road, Winnebago, Ill., (815) 335-2915, seversondells.com. April 27, 6-8 p.m. What is the difference between a frog and a toad? Can you identify them by their “calls?” Bring the family to find out on this guided hike along the Galena River Trail, beginning on the east side of the Meeker Street footbridge in downtown Galena, Ill. Jo Daviess Conservation Foundation (JDFC), 126 N. Main St., Elizabeth, Ill., (815) 858-9100, jdcf.org. April 28, 8 a.m. & 9:30 a.m. Begin your morning with a delicious breakfast, meet the Butterfly Fairy, and enjoy fun butterfly activities before a trip through the Simply Spring exhibit to see the native and tropical butterflies up close. Special gift for children. Reg. req. Nicholas Conservatory & Gardens, Rockford, (815) 987-8858, rockfordparkdistrict.org/ncg. April 28 & May 5, 8 a.m.-noon. Get your garden ready for planting; compost is $6/bag. Rotary Botanical Gardens Horticultural Center, 825 Sharon Road., Janesville, (608) 314-8416, rotarybotanicalgardens.org. April 28, 8:30, 9 & 9:30 a.m. All-day trek includes trolley transportation, guides, a box lunch and T-shirt. Res. req. Starved Rock Lodge, Starved Rock State Park, Ill. Rts. 178 & 71, Utica, Ill., (800) 868-7625, starvedrocklodge.com. April 28, 9-11:30 a.m. Make a campfire breakfast, then tour the farm, cuddle with baby goats and hear about summer camps and activities. Reg. req. for age 3 and up. Angelic Organics Farm, 1545 Rockton Road, Caledonia, Ill., (815) 389-8455, learngrowconnect.org. April 28, 9 a.m. The 34th annual Heritage Run includes 10K (6.2 miles) and two-mile races and half-mile Color Fun Run. Start at 9 a.m. at the corner of State & Wyman for 10K and two-mile; Color Run starts at 11 a.m. in front of BMO Harris Bank Center. Stewart Square, 308 W. State St., Rockford, (815) 489-1252, rockriverymca.org. April 28, 10 a.m.-1 p.m. Play with colors and numbers, things to stack and things to roll. Curious George appears for story reading at 10:30 a.m. and 12:30 p.m. Discovery Center, Rockford, (815) 963-6769, discoverycentermuseum.org. April 28, 10 a.m.-2 p.m. Earth Week celebration includes activities for the whole family, with many stations to visit at your leisure. Severson Dells Nature Center, Winnebago, Ill., (815) 335-2915, seversondells.com. April 28, 11 a.m. & 2 p.m. Become a detective for the day and solve a case by exploring different techniques used by law enforcement. Bring a change of clothes. Midwest Museum of Natural History, 425 W. State St., Sycamore, Ill., (815) 895-9777, mmnh.org. April 28, 1-5 p.m. Build a shelter that can work at a primitive campsite; materials and tools provided. Reg. req. Age 8 and up. Byron Forest Preserve District, Byron, Ill., (815) 234-8535, byronforestpreserve.com. April 28-29, 10 a.m. Step back in time to experience American frontier life in the 1840s. Meet traders and trappers, French voyageurs and Native Americans. Enjoy food and mercantile vendors, demonstration and black powder shooting. Rain or shine. Macktown Living History Center, 2221 Freeport Road, Rockton, Ill., (815) 624-4200, macktownlivinghistory.com. May 1-Oct. 31, Sat.-Sun. 9 a.m.-4 p.m. On the site of a battle fought during the Black Hawk War in 1832, Apple River Fort comes to life through living history activities, demonstrations and conversation with interpreters in 1830s-style dress. Apple River Fort State Historic Site, 311 E. Myrtle St., Elizabeth, Ill., (815) 858-2221, appleriverfort.org. May 1, 7-8 p.m. Explore the woods in search of early spring blooms that take advantage of the sunlight. Severson Dells Nature Center, Winnebago, Ill., (815) 335-2915, seversondells.com. May 4, noon & 1 p.m. Learn all about seeds and what they need to grow into healthy plants. Create your own experimental environment for seeds to take home and observe. Nicholas Conservatory & Gardens, Rockford, (815) 987-8858, rockfordparkdistrict.org/ncg. May 4, 5-8 p.m. Bring the family for games, crafts and snacks as you celebrate all things “Star Wars.” See the wacky 1978 “Star Wars” Holiday Special, made-for-TV movie. RSVP online. Rock County Historical Society, Carriage House, 450 N. Jackson St., Janesville, (608) 756-4509, rchs.us. May 6, 10 a.m.-3 p.m. Wild Ones of Rock River Valley offers native woodland plants at affordable prices. Plant those shady areas with woodland wildflowers, grasses, sedges and ferns native to northern Illinois. Nicholas Conservatory & Gardens, Rockford, (815) 987-8858, rockfordparkdistrict.org/ncg. May 8-9, 6-8 p.m. This two-session class teaches the process of creating jewelry with poured resin, using molds and adding color; all supplies furnished. Participants are welcome to bring a sentimental button, photo or ephemera to use in crafting their jewelry. Reg. online. Freeport Art Museum, Freeport, (815) 235-9755, freeportartmuseum.com. May 9, 6-9 p.m. Celebrate your inner artist as Studio 317 hosts an evening of sipping wine and creating your own masterpiece, with step-by-step instructions from seasoned painting instructors. Register online. Klehm Arboretum, Rockford, (815) 965-8146, klehm.org. May 11-13, Fri. 9 a.m.-6 p.m., Sat. 8 a.m.-5 p.m., Sun. 10 a.m.-4 p.m. Includes wide range of vegetables, compost, herbs, perennials and shrubs. Rotary Gardens Horticulture Center, 825 Sharon Road, Janesville, (608) 314-8416, rotarybotanicalgardens.org. May 11, 5-8 p.m., Sat. 9 a.m.-4 p.m. Hundreds of native plants donated from the area’s best gardeners. Free admission to Friday-night preview with donation of 10 outdoor plants the week prior to the sale. Klehm Arboretum, Rockford, (815) 965-8146, klehm.org. May 12, 9 a.m.-noon. Join archeologist Phil Millhouse and Chloris Lowe, former president of the Ho-Chunk Nation, for a guided tour of the JDCF’s Portage Preserve, including the Hopewell burial mounds. A rare opportunity, as the site is not open to the public. RSVP to info@jdcf.org. JDCF, Elizabeth, Ill., (815) 858-9100, jdcf.org. May 12 & June 2, 10 a.m.-1 p.m. This hands-on workshop introduces the process of cheesemaking from start to finish. Experience making ricotta, mozzarella and more; then sample your handcrafted cheese. Reg. online. Angelic Organics Farm, Caledonia, Ill., (815) 398-8455, learngrowconnect.org. May 15, 10-11:30 a.m.; June 5, 3-4:30 p.m. Experience the transformative and healing powers of a meditative walk in nature through a section of less-traveled, unpaved trails. Rain or shine. Register online. Klehm Arboretum, Rockford, (815) 965-8146, klehm.org. May 15, 7-8 p.m. Celebrate Winnebago County’s seven species of oak trees, which have profoundly influenced the development of human civilization while supporting many other organisms. Severson Dells Nature Center, Winnebago, Ill., (815) 335-2915, seversondells.com. May 10, noon & 1 p.m. What is it? How do you make it? What do you do with it? Find out as you dig through, sort and examine potential composting materials. Class will be held outside, weather permitting. Dress accordingly. Nicholas Conservatory & Gardens, Rockford, (815) 987-8858, rockfordparkdistrict.org/ncg. May 19, 10 a.m.-3 p.m. Enjoy a day of hands-on experiences milking goats and gathering eggs; make goat milk ice cream to enjoy under the trees. See how to produce soil from kitchen scraps with worm boxes. Reg. for participants age 3 and up. Bring sack lunch. Angelic Organics Farm, Caledonia, Ill., (815) 398-8455, learngrowconnect.org. May 26, 5:30-7:30 p.m. Bring the family for a tropical luau party to learn about pollinating insects and birds, design your own flower to take home and much more; the butterfly exhibit continues. Nicholas Conservatory & Gardens, Rockford, (815) 987-8858, rockfordparkdistrict.org/ncg. June 2-3, Sat. 9 a.m.-5 p.m., Sun. to 4 p.m. Enjoy live entertainment, nearly 100 vendors selling flowers, antiques and art, a food court and beverages from Prairie Street Brewing. Klehm Arboretum, Rockford, (815) 965-8146, klehm.org. June 3-10. Twenty-five restaurants offer special prix-fixe meals for lunch ($10) and dinner ($25/$35.) Many indoor and outdoor activities held throughout the week. Diners choose a charity to receive $5,000 toward its mission. Tickets/Info: (800) 345-1020, visitlakegeneva.com. This entry was posted on Tuesday, April 3rd, 2018 at 11:58 am	and is filed under Annual Guide, Recreation & Destinations. You can follow any responses to this entry through the RSS 2.0 feed. Both comments and pings are currently closed.